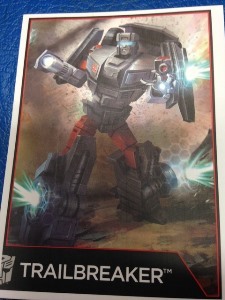 A veteran of many battles, Trailbreaker specializes in protecting his allies with near-indestructible force fields. While incredibly valuable in combat, his shields require massive amounts of energy to maintain, forcing him to manage his reserves carefully. I can safely say that Trailbreaker is a character I never had any urgency to own. He didn�t strike me as interesting as a kid, nor a few years back watching over the Generation 1 cartoon series. He�s got a unique ability, but that�s really about it. Otherwise, he scratches the 1980�s off-road vehicle itch. I previously owned the Generations Thrilling 30 Trailbreaker, but I found that figure to be a little short and squatty, not to mention that I thought his shoulders would break at any moment. 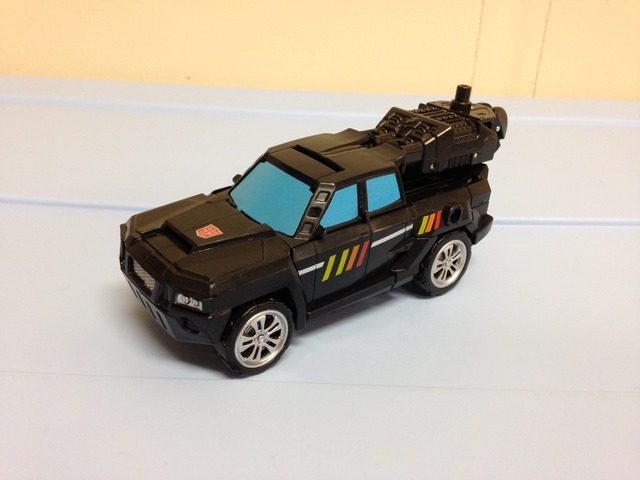 Needing some combiner limbs for my own �custom� Autobot car combiner, and having ample stock of Trailbreaker at some local discount shops, I decided to have another go at the character. This time around Trailbreaker is taller, and oddly, almost too skinny. That doesn�t mean he�s a bad figure though. On a side note, this is the fourth use of this mold. Offroad (Menasor) was the original use, followed by a retooling to be used as First Aid (Defensor), then retooled/repainted as Ironhide (Ultra Prime), and finally we have Trailbreaker (Sky Reign). I�m not using him with Sky Reign, but rather a combiner of my own �design� that uses Battle Core Optimus Prime, Prowl, Ironhide, Smokescreen, and finally Trailbreaker. Trailbreaker�s alternate mode is a nondescript off-road type pickup truck � I think it sort of resembles a modified Toyota Tacoma. This is pretty close to his Generation 1 toy, which was a pickup truck with a bed topper. With Trailbreaker�s truck mode, you can emulate the bed topper a bit with the combiner part; there�s a long peg on the back that it attaches to. It�s not spot on, but it kind of does the trick. Personally I keep him in the simple pickup mode without the combiner part. The other included weapon � a battle axe! � can be pegged onto either side of the truck for storage. As with most of the CW figures I have experienced, the weapon looks quite out of place when attached. I suppose the bright side is that at least you can connect it. Aesthetically, Trailbreaker�s truck mode looks pretty nice. The vast majority of the mode is black plastic, but he�s got his traditional red and yellow detailing on the sides to break it up a bit. There�s a tampo Autobot symbol on the hood of the car, slightly off to one side. Personally I thought it would look better to place it in the middle (like on Ironhide) but it works well enough. The rims, grill, and headlights are nicely done in silver, and the windows are painted light metallic blue. Even though the mode is mostly flat black, there�s enough paint apps around to make it look pretty good. Everything in truck mode is snug and snaps together well. The wheels roll nicely, and there aren�t really any robot parts hanging around, save for the feet in the back. Overall, I think Trailbreaker�s truck mode is pretty solid even though it�s not a 100% recreation of his G1 toy. I actually like it a little better than I anticipated. Transformation from truck mode to robot mode is quick and easy, a staple of the CW line. It�s pretty fun, and it�s not going to win any awards for originality. Once in robot mode, you have yourself a slim Trailbreaker. Aesthetically he looks OK, but don�t expect him to be a spitting image of his G1 toy or cartoon model. The biggest issue is the lack of a car hood for a chest � the car hood and windshield are placed on his back in this version. It�s not a bad change in aesthetic, but the hood produces quite a bit of issues with the shoulders due to its positioning (more on that later). The other unfortunate problem is that Trailbreaker now looks like he�s sporting a giant hood or parachute on his upper back, and there�s no way to move this part out of the way. It oddly doesn�t really make him back heavy, but it�s kind of an eyesore. The rest of Trailbreaker�s look is done rather well. There�s more red and silver around in the robot mode, which breaks things up nicely. He�s even got some silver detailing on his shins and painted windows on his chest to give the slight appearance of his original self. The one part that I was apprehensive about was his right hand � it�s a force field generator and nothing else. You can peg a weapon to his forearm, but I think it looks clunky that way. I�ve softened to the hand quite a bit over the last week, and honestly it makes him a little unique. Trailbreaker�s head mold is done rather well � it�s boxy and appropriate for the character. I like it better than the Thrilling 30 version. Articulation on Trailbreaker is pretty good, but as I mentioned earlier, a lot of the shoulder movement is hampered by the hood on his back. The shoulder design leaves Trailbreaker with door parts that jut out from his shoulders which constantly bump into the truck parts. It takes a bit of finesse to get his arms in proper spots, and it works OK, it�s just quite limited. Otherwise, the arms themselves have a decent range, as do the legs. He is fairly well balanced, except for a little bit of back heaviness, but nothing that can�t be worked out as the joints are nicely snug and do a good job of supporting the weight. 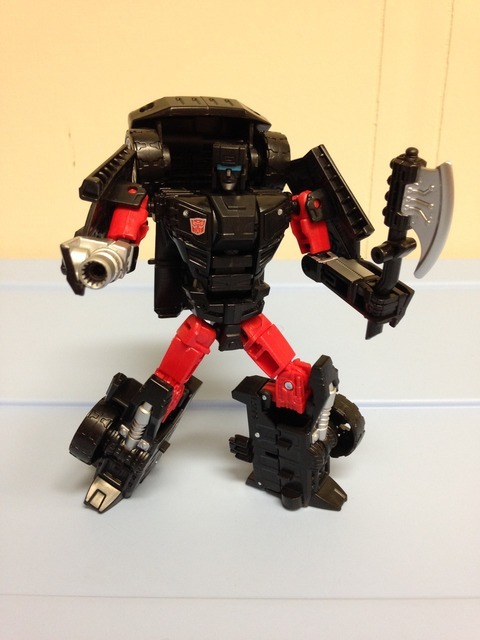 Trailbreaker comes with two weapons that I mentioned earlier � the combiner weapon/hand/foot and the battle axe. I actually don�t mind the battle axe too much, as he already has the force field generator as a hand, which can double as a blaster. The axe is black, but the blade is painted silver, and he kind of looks cool with it. I suppose if he�s �breaking trails� anyways, he might as well chop some wood. The other �weapon� doesn�t work as well, and is really just intended to be a hand or foot for the combined mode. It�s nice that Hasbro tried to make it work as a weapon, but it falls short. Interestingly, the hand is molded and painted as such that you can stick it into the car hood on his back and mimic his old light bar that protrudes from his back. It�s a cool little addition for the fourth use of this mold � Hasbro could have taken the lazy route by now, but I give them bonus points for trying. Finally, Trailbreaker can be used as an arm or a leg � standard for the CW Deluxes. I prefer him as a leg, and as is true with the CW figures so far, he works OK as either, and tabs together well in either case (better as a leg though). The CW line is good for multiple uses of figures, and I think CW Trailbreaker is best suited for use as a combiner rather than a standalone figure. Transformation Design: 5. Simple and quick, nothing flashy. Getting the legs to tab in are a little fiddly. Durability: 8. Sturdy all around. Fun: 7. Robot, truck, and combiner limb. The little extras thrown in like the CW weapon doubling as his light bars are nice touches. He�s also got a unique force field generator as a hand. Aesthetics: 7. 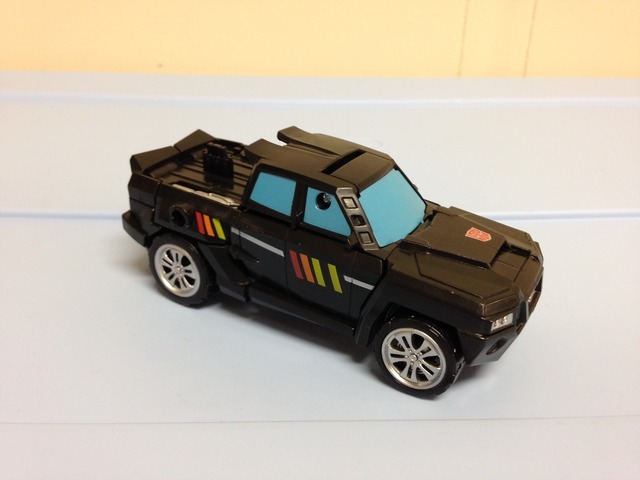 Well, it�s obvious this mold wasn�t intended as Trailbreaker. But it works well enough, and he doesn�t look terrible. The truck mode is really nice. Articulation: 6. He�s really good until you hit the shoulders, and that�s a problem. Value/Price: 7. I got him on the cheap at a discount shop. At full MSRP this would be a lower score. He�s pretty fun as a combiner figure. Overall: 6. I like Trailbreaker a whole lot more than I thought I would. He�s not great, maybe a bit above average because he can be used with other CW figures for some added fun. Hasbro actually tried a bit with this one � a new head, force field generator hand, and the CW weapon/light bar. I think that�s fairly monumental for a fourth time use of a mold. If you can't get around that hood on his back though, he's not for you.